Bael plant, Aegle marmelos, Bengal Quince, Wood Apple, Stone Apple, Bilva, Bel Patra. Grow plant out in pots. Best position is in protected, dappled light. Transplant when about 30-40cm tall . When established, Bael is adaptable to most positions and soils. Bael seed is also available. Small; 40mm tube, about 1 year old. A reasonable amount of growing skill required (no novices). A lot of patience essential. 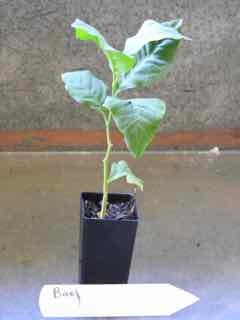 Advanced: 100mm maxi pot, more than 2 years old. Almost full proof, but still requires some patience.